Imagine a portable tiny house that you can plant on stilts literally anywhere your heart desires! Gerhard Feldbacher of Austria has made it a reality with his simple home on stilts. The house is 8′-6″ wide, can be transported on a flatbed truck and features stilts that act as its foundation once it reaches its destination. Getting inspiration from RVs, Gerhard‘s design features pop-out’s which give this tiny home additional space for sleeping. 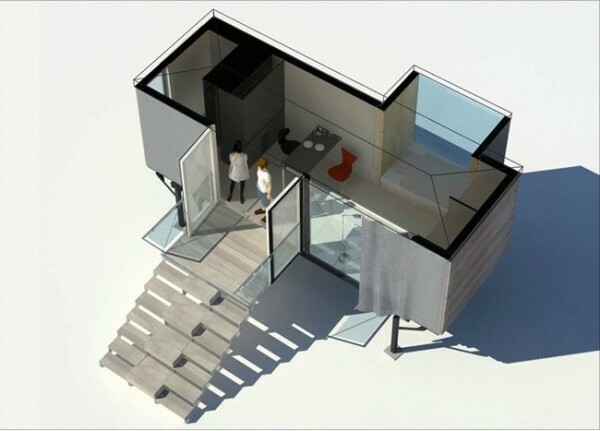 Aside from the sleeping quarters, this micro home features a living room, kitchen, dining area and bathroom. The kitchen can be closed off to the rest of the unit and the living room features floor-to-ceiling storage units. The structure of the home is made using 4-inch Cross Laminated Timber (CLT), which is then protected by a ventilated rain screen that’s finished with larch siding. The home also features a small entry deck which can easily be folded up for transporting. Natural light comes in from three different entry points giving this space plenty of sunlight during the day and a cozy view at night. You can help us spread the word on this house on stilts by “Liking” on Facebook using the button below and re-sharing this story using the e-mail and social media re-share buttons below. Every share helps, including yours. Thank you so much. If you enjoyed this tiny house with legs you’ll absolutely LOVE our Free Daily Tiny House Newsletter with even more! Thank you! Yea, I don’t get why the stilts either, unless in a flood plain, but around here, the stilts would need to be 12′ high! There is no such thing as outdoor living here in the Memphis, TN area! Well, there is for 2 weeks in what we commonly call spring, but really is the tail end of winter. We skip spring altogether and charge right into Summer. Summer often turns directly into Winter, leaving the leaves often confused, they don’t know whether to turn colors or just turn loose. That’s not to say that this isn’t a perfectly lovely tiny home. The stilts make it easier to load (or reload) onto a flat bed trailer/truck. Instead of needing to lift the tiny house, a trailer can be reversed under it, and the house then lowered again. Ah, I get it. Don’t like it, because it’d be just as cheap to just build it on the trailer and then it’s ready to go when you need to go. But, it’s still nice, I just don’t like the way it is set up as a rule. To each his own, though. Yes, I too question the value of the stilts unless you are in the desert and are paranoid about poisonous snakes, or you are trying to get a better vantage point for a particularly nice view. Being up on stilts only makes the place vulnerable to high wind storms. At least if it were up higher, you could put one of these in-town and park a compact car underneath with a space saving spiral staircase. Hey, Lisa E. Nice to see you, again. Cahow, that made me cackle. Snakes can climb steps. Should be real interesting in a wind storm. The stilts serve two purposes that I can see. One is that it increases your view. The second is that it is an inexpensive alternative to a traditional foundation. It it was a permanent home the pilings would have to be sunk below the frostline of course (per your local building codes). I think the flat roof would be more problematic. Shipping container houses are flat but they are metal. This is made of wood. Presumably, the stilts are sturdy, you pranksters! May be it is my years of RVing, but I really like this! It doesn’t take a rocket scientist to figure out that the stilts should be made of durable material (steel beams would be good) and securely attached. The design has many possibilities. I would say definitely away from the critters and such. I just admire these tiny house geniuses and their ingenuity. Not just swamps but simply too much rain…..
truck or have it permanently under the house. A great idea. What a great design. The stilts mean you can erect this TH on uneven ground and also get the house above flood level both for very little extra cost. Good thinking. Thanks for sharing and cheers from Australia. Good point about the flood levels for places like NOLA. The stilts are common in Europe in the transport industry and have their origin before shipping container on a general scale had been coming up. They allowed to ‘unload’ the whole loading platform or box body and use the truck or trailer without waiting to be discharged. They are made like a container frame but have strong made legs which are folded up when loaded. The driver can discharge the ‘cargo’ without any additional equipment like a crane or folk lift just by pull out and fold down the legs using a simple winch to raise the platform. They are strong enough to carry almost 30 tons. I don’t know how heavy Gerhard’s tiny homes are but I guess that they are less. subsidence of the stilts or using four deep seeded foundation. I like the modern look of his house and huge glass areas make it appearing bigger than it is and I am wondering why not more tiny house builders are using slides to extend interior space when parked instead of going high with cramped sleeping lofts which aren’t favorably when towing. Beside that the ratio of width and height doesn’t appear to be in harmony. I guess, that more conservative guys don’t like these boxy style house but it is another step to keep the house simple and its easier to build, too. you are right about slides vs lofts and ratio design harmony. Good design is important to me. Also as I am building the whole house myself I wanted a simple design easy to build. Slide outs just look too hard but after your comments it’s back to the drawing board and talking to a metal worker for the slide mechanism design. Luckily I’ve only just finished putting the floor down on the trailer and have yet to order the panels. The stilts would work in risk of flood areas. I do like the layout. Nice sleeping nook. This place would work (mostly) for my part of Florida. I do have swampy areas on my land. I also do have an occasional rattler or moccasin to deal with. I would like a steel roof that overhangs the structure about 6 ft. in all directions. It does tend to get warm in central Florida in the summer. But all in all, this would be very serviceable for me. I’m looking to put something like this on some land in Golden Valley, AZ. The area has seasonal flooding so building codes already say door has to be 2 and a 1/2 feet up. 3 feet would be better. There’s a lot less hassle since you don’t need an engineer to sign off with no foundation, and the wind “sweeping under” is a cooling feature used throughout the Old West until modern air conditioning came along. This is the ‘Home To Go’ layout. They also have a ‘Home To Stay’ layout that has two bump out bedrooms adjacent. Marvelous. I can’t tell how adjustable the supports are but I did see some versions about 6″ off the ground. If each support is independently adjustable this would also save on site prep and soil disruption. An ingenious solution to a non-existent problem. Stilts are a very functional idea. Perfect for rocky or lava landscapes such as the desert scrub of New Mexico or Hawaii especially where lava is an issue such as on the big island. Much cheaper and faster than building a foundation. A real time saver and way more affordable. We noticed it’s transported on a Mercedes Benz Arctros truck. That’s swank! Very posh! First class! Strangely, I like it. Unsure why…but the soil must be capable of supporting 4 point loads instead of perimeter. I’ve had nightmare soil conditions on some sites. But really makes loading and unloading a breeze. No crane!